Default Company Greeting: Thank you for calling “My Company”. If you know your party’s extension you may dial it at any time. For the Operator press 0 or stay on the line. For the Dial-By-Name directory press 9. Note: The Auto-Receptionist section of the Office@Hand Online Account is only accessible to Account Administrators. Go to Phone System > Auto-Receptionist. You can view the following tabs and drop-down box on the Auto-Receptionist section. For more information on how to configure these topics, go to Auto-Receptionist General Settings. This tab let’s you add an Interactive Voice Response Menu, that allows your Auto-Receptionist to interact with your callers through the use of DTMF tones input via keypad. For steps in adding an IVR Menu, go to Office@Hand: Setting up the Multi-level IVR via Online Account. XML Editor – lets you create your IVR Menus in XML. Visual IVR Editor – lets you configure your Multi-Level IVR using an easy to use graphical interface. 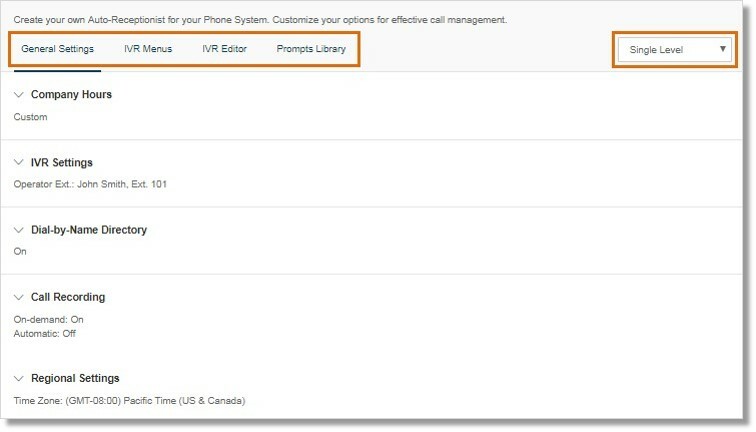 This tab lets you import or record prompts for your IVR Menu. For more information, go to IVR – Set up the Multi-level IVR via AT&T Office@Hand Online Account. Single-Level IVR – Calls to your company number are routed to Office@Hand’s built-in Auto-Receptionist. To set this up, go to Office@Hand: [ADMIN] Setting your Company Call Handling and Operator Extension. Multi-Level IVR – Calls to your company number are connected to a top-level IVR Menu which can be configured to connect to additional IVR Menus or other system extensions. To set up this feature, go to Office@Hand: Setting up the Multi-level IVR.